Immigration Archives - Read. Think. Act. 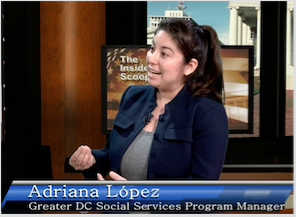 (Feb. 14, 2018) Catherine Read interviewed Dr. Klara Bilgin, Dean of the School of Public and International Affairs at Virginia International University to discuss the Diversity Visa Lottery Program. 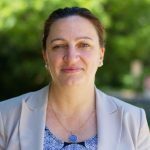 Born in Bulgaria, Dr. Bilgin has spent her academic career in America, starting in 1997 when she attended the University of Delaware. She was fortunate to be a winner of the Diversity Lottery, and was happy to share her views on why she feels strongly that cutting this program would be detrimental to the United States. In October of 2017, Donald Trump called for the complete shut-down of the program after a truck attack on civilians in New York City, citing the fact that the truck driver who committed the crime immigrated via the lottery from Uzbekistan. The history of the Diversity Lottery Visa dates back to 1986, when it was originally designed to help Irish and Italian immigrants gain a legal path to citizenship . The program has evolved over time, and now includes a random lottery that allows entry for 50,000 lucky winners out of approximately 14 million applicants on an annual basis. Applicants apply online through the State Department in October of each year, and entrants find out if they have won the lottery by the following May. After the winners have been selected, an extensive vetting process then takes place to ensure that the applicant has the required education, 2 years of job experience, proper documentation, health records, and passes a safety and criminal background check. Dr. Bilgin asserts that it would be a grave mistake to allow this program to be eliminated. In her travels across the globe, as an election observer and in academics, she meets people who put their hopes in this lottery year after year. These people are looking for a second chance to make a better life for themselves and their families, a quintessentially American ideal. From a political perspective, this lottery is a critical element in the Soft Power model. Millions of people across the globe will continue to be invested in the prosperity of the United States if they believe that they have a chance to come to the country. As people do win entry via the lottery, they will send money and gifts back home, creating a dense network of people who are intimately connected to the United States. This creates good will, a positive bond, and a strong connection with America. Dr. Bilgin notes that if this program is eliminated we will make more enemies than friends, and would send the wrong message to the rest of the world. She also believes it would create a vacuum, and allow space for other world powers to step up and fill the void. (July 20 2017) Catherine Reads speaks with local attorney Lisa Johnson-Firth of Immigrants First, PLLC about the shift in policy regarding enforcement of immigration laws and which immigrants are the focus of this shift under the Trump Administration. Lisa Johnson-Firth does presentations for many groups in the area entitled “Know Your Rights.” In the first segment she discusses what it means to be “out of status” and the appropriate measures to take when being pulled over by police. 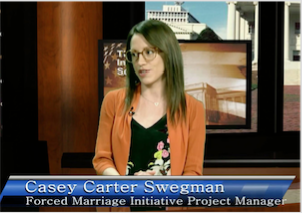 While Virginia is a “name only state” and we are not required to give anything other than our names, Lisa talks about the practical issues of cooperation with law enforcement while being aware of giving information that can and will be used against us in a court of law. The point of her Know Your Rights presentations is to make certain that people in our community know their legal rights and also the practical considerations of how much to say and when. Catherine and Lisa also talk about the various groups of people in this country who are “out of status” which includes those who have overstayed their student or tourist visas from countries around the world. Europeans and non-Hispanic people do not appear to be the target of this crackdown on immigration which brings into question the profiling of anyone who might be an “out of status” person in this country based solely on their appearance. This seems to be driven by a fear of gang members and criminals pouring across our southern borders instead of the many women and children who are fleeing violence in their own countries as refugees. 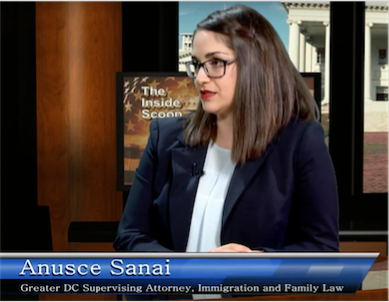 In the second segment, Lisa discusses those who seek to claim asylum here and the process for that and how it varies from one country to another. There continues to be a stream of unaccompanied minors coming across our boarders from Central America and managing that flow is taxing our resources at the border and is putting these children in danger. This risk is driven by desperation and until the violence subsides in those countries, the flow of illegal immigration is not going to slow down. The final part of this show asks some fundamental questions about dealing with illegal immigration going forward and what can be done to craft better public policies around this issue. We must also be honest about the benefits of immigration to our communities in this country as well as to the immigrants themselves. For more information visit Immigrants First, PLLC. (July 12 2017) Catherine Reads speaks with local attorney Lisa Johnson-Firth of Immigrants First, PLLC, and Terri Angelotti, of the Centreville Immigration Forum. The multi-national make-up of the Northern Virginia region has made new immigration initiatives a source of anxiety for families in this region. Schools are working to manage the anxiety of the children in their classrooms and the judicial system is struggling to manage the sudden caseload increase. Lisa Johnson-Firth has a legal practice that serves those in the immigrant community. She talks about the nature of the “removal process” where some local residents are taken four hours away to a facility in Farmville, VA, to await a hearing. Sometimes a person taken into custody may not be able to contact their family immediately to let them know what has happened. The local Immigration Court located in Arlington, VA, is struggling to manage the burgeoning caseload, with some cases schedule as far out as the year 2023. When asked about how this is affecting children in the immigrant community, Lisa talks about her training with Head Start teachers and the fact that teachers are often on the front lines of dealing with these situations with little training and few resources. In some instances, children left behind when their last parent has been removed from this country are placed into the foster care system. 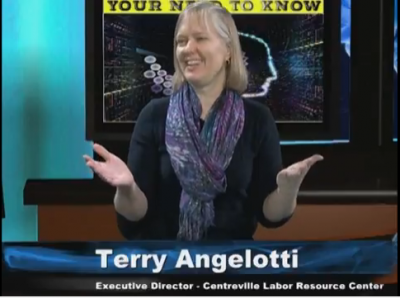 In the second segment, Terry Angelotti, Executive Director of the Centreville Labor Resource Center, talks about the genesis of the Centreville Immigration Forum in 2007 and the opening of the CLRC in 2011. The center has been operating in donated space for over 5 years and they do not use a penny of tax payer funds. The operating costs of the center are covered by privately raised funds and the need to fundraise is constant. The CLRC offers classes to improve the trade skills and the English proficiency of those at the center and prepare them to take more highly skilled jobs. They continue to offer a stable source of laborers to local contractors and homeowners and to make certain their workers are not victims of wage theft. As part of the community response to this increased pressure on the immigrant community, the Western Fairfax Immigration Strategy Group was formed earlier this year. This is a coalition of community groups, non-profits, and faith communities that serve immigrants and want to better coordinate their efforts. The first 5 meetings saw 28 groups represented with about 55 participants coming from the Centreville-Chantilly-Fairfax area as well as from Reston and Prince William County. Speakers for these meetings have included representatives from the Fairfax County Police and Sheriff’s offices, local parent liaisons, a Detention Watch Network Organizer and others involved in serving immigrant populations.The group has also served as a bulletin board for notices of Know Your Rights. There are many opportunities to be involved. Volunteers and donations are always welcome at the Centreville Labor Resource Center, and organizations with an interest in helping with broader issues affecting our local immigrant communities should contact the Western Fairfax Immigration Strategy Group through Terry Angelotti. www.CentrevilleImmigrationForum.